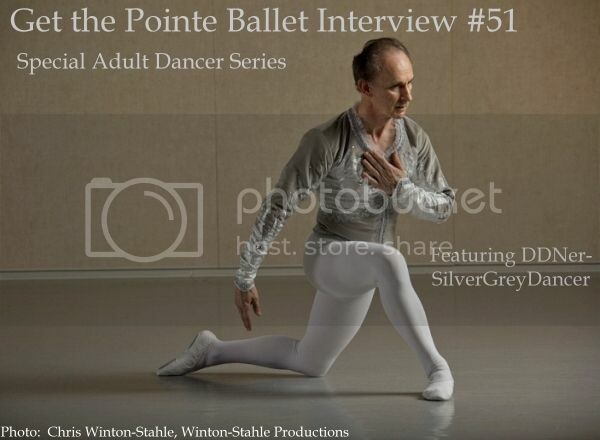 dance.net - Get the Pointe Ballet Interview 51 The Adult Dancer Series, Featuring SilverGreyDancer (10174870) - Read article: Ballet, Jazz, Modern, Hip Hop, Tap, Irish, Disco, Twirling, Cheer: Photos, Chat, Games, Jobs, Events! Edited by smileywoman (141214) on 2014-03-03 15:02:32 ..
Edited by hummingbird (128773) on 2014-03-06 08:58:00 Removed the odd symbols that appeared. 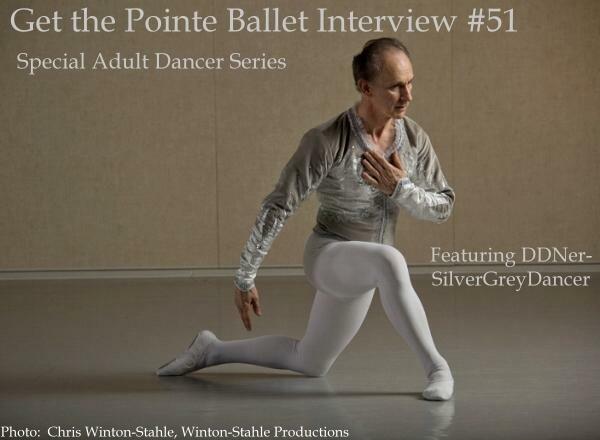 Smileywoman is super excited to bring you the FIRST Male DDNer Ballet Interview! What brought you to study ballet? A: At the suggestion of a girlfriend, I had taken a few classes when I was in college, but quickly put it aside after we broke up. Then in my early 50s, I ran across an article on the internet called [i]Confession of a Ballet Junkie by Tom Parsons. It was really clever with a nice tongue and cheek style. Mr. Parsons had his email listed, so I emailed him to say how much I had enjoyed what he had written. I mentioned that I had even entertained the idea of taking class. He emailed me back and suggested that I should. That summer, I started taking class on a whim thinking that maybe this was a place I could feel handsome, elegant etc. I have been told by others that there are times that I do look that way. Unfortunately, I do not see it! A: 52, I do not count the few class I took in college. They were so few and I am not sure that I really learned much of anything. Ballet is the only dance style for me, I do not like rolling on the floor! Q: Do any of your family or friends have a dance background or study dance? A: No and yes! I now have many friends that have studied dance. Q: Do you prefer classical ballet or modern choreography? A: Sorry, I am a classical boy! Q: How much time do you dance during the week? Q: Do you study Vaganova, Cecchetti or RAD? A: Since I do not really study at a School, it is kind of a smattering of all. Although a school in their literature says they teach this, that or the other, it is really what the individual instructor learned. So unless all the instructors are certified in a particular method, it will be a mix. Most people think that ballet is codified and to some extent it is. I think it is really difficult to do all ones training without getting something of other styles. Unless of course, you take just from one teacher. Q: How do you prepare for class (i.e. stretching, conditioning, mental techniques, etc.)? A: Always working turnout (hip sockets) during 10 to 15 minutes prior to class and stretching, but not a lot of stretching. The muscles are not warmed up yet! Q: What shoes do you wear? A: Right now, I wear Karl Martins stretch ones and Sansha Pros. I just bought a pair of Angelo Lusios and I am anxious to see how they perform. Q: What does it mean to you to get corrections in class? And what are the most common corrections you receive? A: People get corrections in class? I love getting correction. I am paying for your expertise. Please share your knowledge with me! Do I take others corrections? Yes, but somewhere along the way I need input from an instructor! 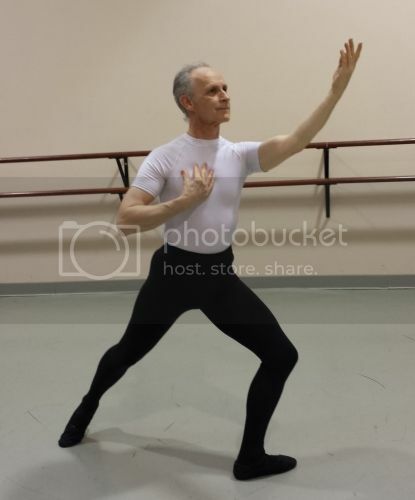 The most common ones recently are learn to accept a lower arabesque en l arriere! You do not have the flexibility in your back to take it up even though you can get it up there! Or I never seem to be forward enough! It is always a subtle move forward. Q: What is your least favorite thing about studying ballet? A: Ladies, lets do this! I actually find this statement offensive. Worse yet is the statement after the first faux pas, Ladies and Gentleman If I am standing in class at the barre, ready to start plies, it is pretty obvious that I am a guy! If you are going to negate my presence from the very start, neither of us are going to succeed in the class endeavor. If you are uncomfortable teaching men/adults, then tell me. I do not want to take a class where I am not wanted. I have, over the course of time, taken two stances: I raise my hand and say What would you like me to do? Sometimes, I just stand there and wait until the instructor says something. Once I got to ronde de jamb en l air before the instructor said anything. Of course, she was apologetic but the damage was done. Q: What is your favorite thing about studying ballet? A: For an hour and a half I can pretend I am a handsome prince. Q: What is your favorite? Adagio or Allegro and why? A: Grand allegro all the way! I just love big jump combos! To me it s like flying! Q: Do you have a signature step, or one that comes easy to you? A: Ah! You are kidding, right? Nothing comes easy in ballet! I am closing in on a triple pirouette to the knee and a double tour is in and out (mostly out) right now. It is sort of exciting. Q: What do you find to be the most difficult skill to master? A: Speed! It is why petite allegro and I are not friends. Q: Do you study pas de deux? What do you think is the most important thing you provide as a pas partner? A: I had been looking for a class in pas since I started ballet. Every time I found a class and inquired about joining they would stop offering the class. So, up until recently it has not been available to me. The instructor I first took class from finally offered to work with me. We started with the Peasant Pas from Giselle. An important thing to provide as a pas partner, is to know when the man is in control and what exactly the ladies need to get to the next step. I am there to make you look good and to allow you to accomplish movements that you cannot do on your own. All other aspects of ballet aside, ballet is pas de deux. All the rest is just window dressing. Q: Have you gone to a Summer Intensive (SI)? If so, what did you learn from your experience? A: Yes, they were at local studios, but I have had some notable teachers. I learned that I could, for the most part, keep up with a 15 year old! Also, famous dancers are not always fine teachers or nice people. Q: Do you do any exercises at home that help your dancing? A: I try to hit the gym at least five days a week. Some weeks are better than others. 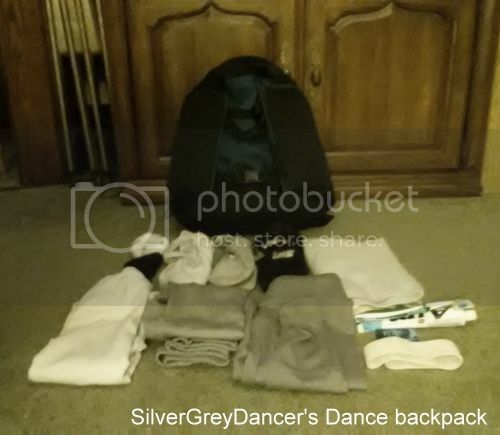 Q: What is in your dance bag? Can we see a picture? A: I like to keep it simple and not lug a lot of junk that I might use. *A bottle of water and a power bar. I also add or remove items as needed for special classes and changes in the weather. Q: What was the biggest obstacle that you encountered in ballet and how did you overcome it? How has it helped you become a better dancer? A: Age perceptions and others perceptions of my ability to improve as a dancer. I am not sure that I can change the age thing, but on occasion I do surprise an instructor. I have learned to become more tolerant of my shortcomings and to keep the frustration level down. Q: As an adult dancer, have you encountered any physical challenges to dance? A: Yes, two. About five years ago, I was ski racing in Western New York and fell on the course. I am famous! I have a video on YouTube showing the crash. It was a pretty spectacular crash. I did quite a bit of damage to my right shoulder, rotator cuff sort of stuff. After four months of rehab, I had a somewhat usable shoulder again. I started taking class about two months after the crash, but how much can you really do when you cannot raise your arm much higher than chest height. It got progressively better and with less pain. Just as I was feeling good about the shoulder, I was working in class on improving my developes en l avant (part of a given exercise) and I felt something pop in my back. Long story, but I ruptured a disc in my back at L5 to S1. I took class for three more months in pain and then decided it was not going to get better. I saw a surgeon and had the rupture removed. The great thing about the surgery was the pain was gone immediately. The bad thing, I could not take class for about 4 months and then just barre for another two. Right now it is pretty good. The injuries have made a few limitations necessary. Circular port au bras still give me some trouble and any long holds in arabesque or attitude en l arriere are pretty difficult. Q: What dance goals are you currently working towards, and what future goals do you have? A: Double tours and to improve the turns to the right. Yes I am one of those rare people that turn better to the left. I know, it is a curse! In the future I want to crack petit allegro. LOL Like that will ever happen! Q: Describe a typical day in your life. A: I do have a full time job in arts administration. I have not retired yet, so that takes a good chunk of the day. I am up at 6:00 a.m. when the cat alarm goes off. The nice thing is she has a snooze button! If I go immediately to the gym, I am back by 8 a.m. and at work by 8:35 a.m. Since I take class where I work, (university setting) I schedule my day around class at the university, so I am out by 5:30 p.m. If I did not make it to the gym in the morning, I am there in the evening. Two to three days a week I go to another university, 50 minutes away to take other classes. I try to keep my Sundays open. Q: After you have had a bad day, what motivates you to go to class? Does it lift your spirits? A: I think ballet is an endorphin. It just lets you forget all the crap out there! Q: What was your first dance performance and what was your role in it? How old were you? A: I have never been cast as a dancer except in a few small recital pieces. 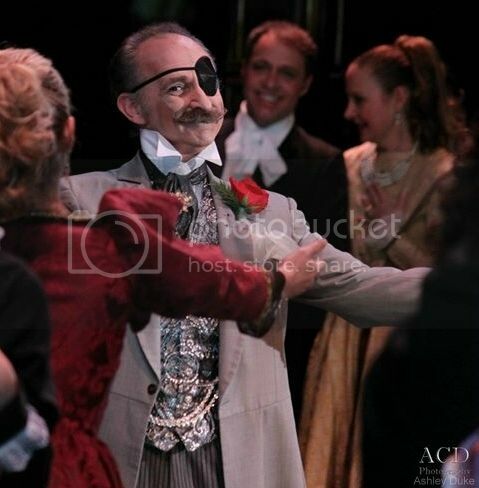 The first role I had in a ballet was Drosselmeyer in Nutcracker. I was in my early 50s and had just started taking class that summer. I have done that role three times and each time he is very different. Q: Do you have any rituals prior to performing? A: I have an MFA in theatrical design from at NYU and worked commercially in the city for five years. I do my own costumes when required. Not because I want to but as one costume mistress put it, You will do a much better job than I could ever do! I am not sure that is really true. If the costume is set, it is just the makeup, check the props and I am ready to go! I do not spend a lot of my preshow time worrying about the role! Q: What is your biggest fear during a performance? A: That is easy! I might forget some of the blocking! (steps) It is only happened once in a dress rehearsal for a pas de trois. It was very unsettling. Q: What has your best stage moment thus far? Q: When you are on stage, do you lose yourself in the role (enjoying your experience without worrying about technique) OR are you concentrating on the steps more and overly worried about technique OR do you just say to yourself forget about everything and dance from the heart? A: Always the steps! It is like a line of linked box cars. I think it keeps me from being as free onstage but I am working on it! Q: What is your favorite ballet? Q: What is your favorite variation? Q: What variation would you love to do or inspires you the most? A: I had a great time learning a simplified variation of Golden Idol but I think the slave from Le Corsair. I remember my first exposure to this variation was Nureyev and Fonteyn. I think it imprinted on me. A rare performance that delineates what ballet really is! There are a number of dancer now that do it better, higher, more tricks. I always go back to this particular version as the standard. The ABT with Corella is great too! Q: If you could perform in any ballet in any role, what would it be and why? Q: As an adult male ballet student, has your own perception of dancing ballet changed over time? If so how? A: It is all tricks now. Yes it is exciting to see but what are you giving up to get the tricks? I think characterization has suffered and certainly ensemble work! Personally, I have become a little more relaxed and less intense about getting it right! Q: Do you think there are perceptions about men who dance that need to change? A: Yes, especially, the perception that it is unmanly to dance either theatrically or socially. The world has not change that much regarding this, at least not in the US. Q: Have you encountered any stereotypes about men and dancing? If so, how did you handle it? A: I remember when my wife first found out I was taking ballet class. "What are you gay now!?" I thought this was pretty strange because she had always been involved in the theatrical industry. I just said it was something I always wanted to try and left it at that. She has never seen me dance. So, yes changes still need to be made! It would be nice if men had the choice to study dance without criticism and fear of repercussions. Q: Do you ever feel pressure to not dance? A: Yes, it is the age thing. And no, most people who know me do not know I take ballet class, although, that number is shrinking fast. Q: What do you think of male dancers who study pointe? A: I do not see a reason for it! There are so many things a male ballet dancer has to learn. Why dilute the product by adding pointe. If you aspire to something like Ballet Troc, well then, yes. If you plan on teaching, I can see some experience might be helpful but there are other ways to get that knowledge. There are so few roles for males on pointe. The ugly stepsister and Bottom in Midsummer, that is about it! It hardly seems worth it to me. I have heard it often said that it helps strengthen the feet. I think it just messes with your ankles, knees and back. All of which you are going to need for double revoltades! Also there is a penchants for some men who would rather wear tutus to study ballet. I think this is very detrimental to the image of a male dancer. Q: Have you ever considered studying pointe yourself? A: No, I just look at the girls with the blisters and callous on their feet and I think, "Thank God I do not have to do that!" Q: If someone asked you, "Why Dance?" what would your answer be? A: Why not! I have heard or read that dancing is like flying. I believe that dance is the closest the human soul can come to soaring! Q: Have you ever thought about not doing ballet? What kept you going? A: I had actually decided to stop taking ballet class in June of last year! I was just frustrated with the training situation and the lack of support I was getting from the studios where I was studying. BTW: (not studying there anymore!) I felt ignored and just did not feel I was getting any better, and that no one seemed to want to help me improve. I knew about the Sun King dance camps run by Heidi Winston Stahle, and always thought that I should do it. I went to the June camp in Richmond thinking it was going to be my swansong and then it would be over! At that point, I was not willing to put more time, effort and money into something that gave so little in return, especially if I was not going to get help from the instructors. Richmond was such a positive experience that it changed my perception of the possibilities. At the end of the camp performance, they had a little circle and asked us to comment on how we felt about the camp. I am not the touchy, feely, huggie type person at this kind of invite. So it was a stretch for me to say anything. I said: "If you have any doubt that you can change the perception of a student about themselves, you can! You have truly opened a door for me that I was told was closed." Q: Have you made any sacrifices to study ballet? A: Yes, I do not ski as much and the house and yard are a mess! Q: Does dance affect your social life in any way? How? Are your friends/family supportive? A: Dance is a social life! Well to a small extent, I always think about having to miss ballet class if something else comes up. Dance is not my whole life, it is part of it. Interesting yes! My son, although not interested in dance himself, is quite supportive. Q: If you could dance anywhere in the world (not only in a theatre) where would you dance? A: The school at Theatro Colon (Argentina) I took an SI with the director of the Colon school in Buffalo. A truly wonder man and teacher. Or, the school for Paris Opera Ballet. They have some pretty amazing dancer coming out of that program. Q: If you could change anything about ballet, what would it be, and why? A: That you are considered "washed up" at 35. It is obvious, I will be 62. Q: If you could give one piece of advice to young male ballet dancers, what would you tell them? A: Take advantage of everything that is offered you and ask for more. Be selfish about your training and demand attention when necessary. If you are not getting the attention you need or the training you need you are: A) with the wrong instructor, B) at the wrong school. Be aware of what goes on outside the school where you study in the world of dance. Never accept well enough! Because it is not! Do not study with little girls! You will not get the attention you deserve unless you have a very conscious instructor. You have different things to learn as a male dancer. As the French say: "Vive La Difference!" Lastly, think of dance as a transition to something else you want to do and start preparing for it now! BTW: You never really need to stop dancing but you may need to learn new choreography. Oh, that is more than one thing! Q: Is Performance Important in your Opinion? When I first started to take ballet classes I was told that no one would hire me. (I understood that, I was in my 50s!) A year or so later, after a particularly difficult class, the same instructor stopped me and said "It is too bad you did not start this when you were a child. You could have had a career." It was like he had put a knife in my heart. Thinking back now, I believe he saw the sheer determination and willingness to work towards something that was not really possible given the circumstances. A few years later at another studio, I was told that I was too old to cast as a dancer in Nutcracker. This was the same Artistic Director that took a 16 year old off the street with no dance training and made him the Prince in Nutcracker. I learned it is not always about quality! *Instructors that think I do not want correction. I am paying money for your expertise. Why would you think I do not want correction? *Students who mess up in a combination and just stand there. Get out of the way! *Teachers that endlessly change the combination every single time they give one. Please take an extra minute or two with the music. You will actually get to square one sooner without confusing your students. A: I think most people find me too serious. I am really a funny guy! Q: How does it feel to be featured in Get the Pointe? A: Ah! Yes another moment of fame. Thanks for choosing me to do this. I just hope some guy reads this and thinks "I can do that!" and starts taking ballet class. I hope some teacher reads this and thinks: "Have I really given the guys in my ballet classes a fair shake?" and "Do I ignore the older students in my ballet classes?" If any of these things happen I will consider it a great accomplishment. Thank you for sharing! What I learned about the Prince role is... he has to look kinda young. Sometimes roles are determined by things other than technical ability --- for example, a dancer's looks, gender or ability to fit the costume. Great to learn about your experiences, SGD, as so similar to mine in many ways. Which university do you dance at? I'm dancing at a university too and one of the ballet groups I'm with selected Jewels for the year end show! So I get to do my first ever Pd2 (yeah!) and have sewn fake emeralds to my own design of costume. Just a few years younger than you with only 3 years under my (dance) belt so far. Same reaction from my spouse (who was once a serious figure skater) LOL. Sounds like you are Airborne, Bravo Company too! Removed by hummingbird (128773) on 2014-03-04 12:34:11 Ooops, double post. Just to clarify, I wasn't interested in the Prince role. It's for a young guy. All I wanted was a chance to dance any "dance role." Just a bit frustrating to be told that you're too old to cast at all even though your skills are decent and better than most who were cast! But that is the way it is. Loved the interview, SGD, and loved being your PDD partner in September 2013! Best from Down Under! I own a small dance school that has been doing a children's theater Nutcracker for over 30 years. Two of the adult male dancers who began performing with us back then are still doing their parts, and are now close to your age. I never hold age against a dancer, as even I had to perform in our last show; one of my teens sprained her ankle doing college sports, and I had to sub for her last minute in Flowers. Bravo to you for your "can do" attitude and I wish you many more years of performing. Keep at it! You have the advantage of starting younger than I did. Be patience with yourself. Progress will take time. There is a stigma with guys taking ballet and it is too bad. I personally have wanted to take ballet my whole life, as my sister was a ballet dancer and I would go to her recital and saw a guy in tights on stage and became curious. Yes,I got flirted with by guys in ballet class, which actually made me very curious and I’m now a happily gay male ballet dancer. Guys SHOULD be able to take ballet if they want to not feel bad, I am a different case as I took ballet first, but then quickly realized that I actually wanted to become gay but there are many guys who are straight and it’s too bad that there is such a stigma. Gay and proud of it being a ballet dancer with my boyfriend in class!! what the incredible story! so inspiring! I wish I'd start dancing in childhood and then in high school, but the study was so hard and I've been putting it off all the time... and then I didn't know about WriteMyEssayOnline that can help to meet the deadlines for term paper or essay stressless... but it doesn't matter, because there are successful stories like this. thank you!